followed by the melodious voice of Shreya Ghoshal. Last week Benny Dayal and Neeti Mohan’s duet performance was incredible, energetic and drove everyone crazy. 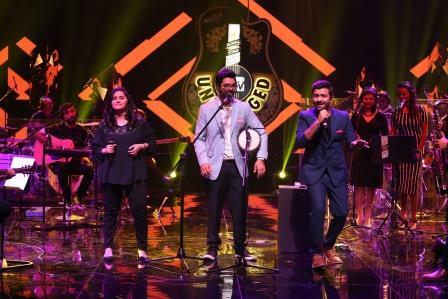 This isn’t the first time the duo Sachin- Jigar has been associated with MTV Unplugged. From grooving to crooning on popular dance numbers and some soulful romantic numbers, Sachin–Jigar will make your Saturday evening a memorable one. Sachin- Jigar will sing songs like Jeena Jeena (BADLAPUR), Chunar, Sun Saathiya (ABCD 2), Mileya Mileya, Beat Pe Booty (FLYING JATT), G-Phad Ke (HAPPY ENDING) and few more.